I know I did not just hear you say that you don’t have MAC Ricepaper Eyeshadow ($14.50) yet because that, my love, would be a makeup travesty of epic proportions. Shoot, I can’t even remember when I first started wearing Ricepaper (I think it was around 1999), but I do remember that it changed my life (as only good makeup can). This shimmery, pigmented peachy gold is one of those colors I find I’m able to wear every single day, and I almost do. I probably reach for it at least a few times a week and wear it most often as a wash over my lids, or along my brow bone as a highlighter (I think it lifts the arches), or at the inner corners of my eyes when I feel I look tired. It’s quite the team player, too. It maintains an excellent working relationship with many MAC neutrals, like Soba, Saddle, Soft Brown, Brown Script, Cork and Smoke & Diamonds, and I think it also works well as an accent color for brights that go well with golds, like blues and teals. Freshwater and Aquadisiac are two of its biggest fans. How do you feel about peachy golden Arena? Similar pigmentation and same soft, buttery texture, but I think Ricepaper looks lighter and peachier to me. Both colors work together really well. In fact, my favorite way to wear Ricepaper actually includes Arena. It’s a Megan Fox-ish look with some subtle contouring in the crease and lots of black liner and mascara. I start with a bit of matte, yellowy beige MAC Paint Pot in Soft Ochre ($16.50) applied as a base. Then, I add Ricepaper, sweep a mix of Arena and Soft Brown into the crease, line my eyes with MAC Feline Eye Kohl and finish with mascara. It’s a pretty easy, neutral look that I can usually knock out in about 10 minutes, and because it is so neutral, it’s one of my fallback looks when I haven’t figured out which direction I want to go with my lips and cheeks. Ricepaper may not look flashy in its pan, but consider giving it a chance. You two might just hit it off. Here’s to hoping that Tabs doesn’t knock ’em over… It could happen. He obviously has no respect for the “No Tabbies on the Desk” rule, even though it’s been in effect for years. How’s your Monday treating you? 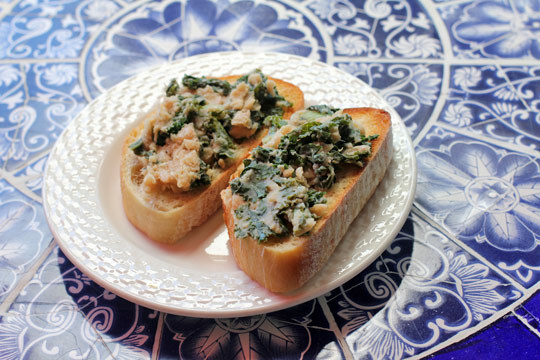 I’m just finishing a late lunch of toasted pugliese with warm cannellini bean, kale and garlic spread and a small side salad. Hope you’re having a great day so far. Have you tried baking kale chips? Seriously good. I don’t have Ricepaper. I’ve always thought that on my pale skin it might not be different enough from Naked Lunch. But I’m going to check it out. I need some more everyday peachy goodness. I haven’t! Do you spray them with an olive oil mister or something and then pop them in the oven? As for Ricepaper, if you already have Naked Lunch you might not need it, but it’s still worth a swatch next time you’re at the counter just so you can feel the texture. It’s amazing — one of MAC’s best. Yep. Olive oil, salt, pepper, maybe some chili flakes or chipotle powder for kick. You can play around with spices. Bake a single layer at 350 for 12-15 minutes. Crunch away. Ok, another MAC eyeshadow to my ever- growing wish list. My Monday’s been pretty good. Heading to bed now, but developed an allergy. *sigh…..blocked nose, teary eyes! Feel better soon, Vonvon. I know how it is to have bad allergies… ACHOO! This may be slightly blasphemous, but I’m not a huge fan of MAC shadows. I know their neutrals are pretty good, but I rarely wear neutral shadows. And I have my Naked palette for that! And those bread thingies look super delicious! I’m too hungry to call them anything but “bread thingies”. The bread thingies were SO GOOD. If you want the recipe let me know. It’s super easy to make and very filling. Please send me the recipe!!!!! It looks sooooo yummmy!!!! Ricepaper! What can I say! I did the miss teen canada world Pageant this wknd and can honestly say I used it on just about every contestant that sat in my chair! most amzing colour! i use and abuse and love Ricepaper, almost everyday. 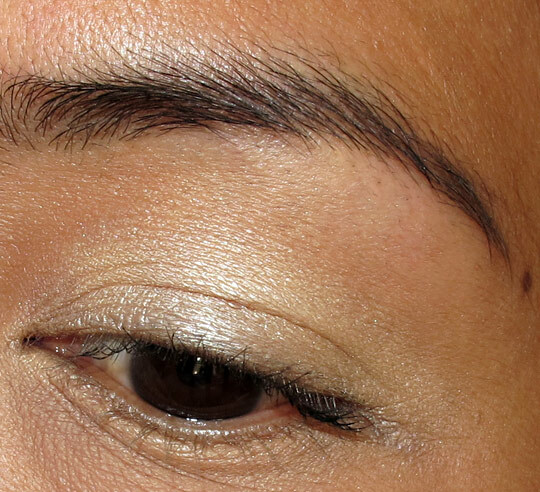 its my fave brow and inner corner highlight, and i also love it as an all over wash of color w/ a bright liner! Do you ever wear Ricepaper with teal liner? I love, LOVE that combo. Which teal eyeliner do you recommend? of course, you know i love ud 24×7 in flipside – thats what i wear w/ ricepaper then. undercurrent pearglide liner works too! That’s so true, I love that it’s not too shimmery and it’s so buttery soft! Agreed. The texture is one of the best things about it. Do you ever layer it on top of the Paint Pots? It does a bang up job of sticking to them. What do you think of Rose Blanc? Hmm, that one’s limited edition right? I’m afraid I don’t have that one… I think it’s from Strange Hybrid, and I didn’t get anything from the release. Right 🙂 You know your MAC shadows! 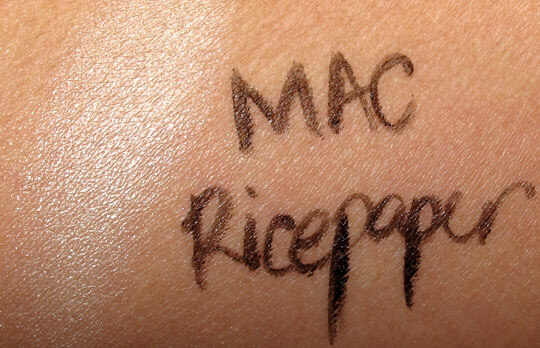 I wanted to get MAC Ricepaper as a highlight because I’ve heard such good things about it. I heard that the yellow undertones in Rose Blanc might be better for my NC 20/25 skin… so I ordered the NYX dupe (Highlight). I hope I didn’t make a mistake by not going with MAC Ricepaper! I’ve heard so many good things about Ricepaper! I already have Shroom, though, for my highlighting needs. How do you think those two compare? 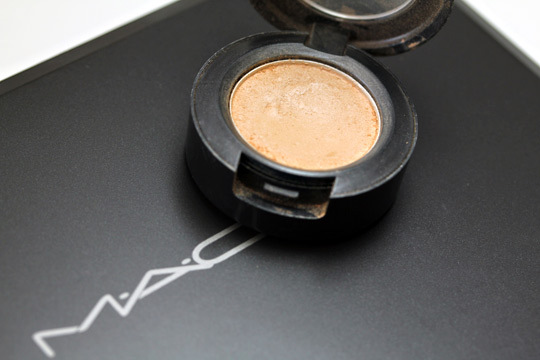 ricepaper was one of my first mac shadows, so it has a special place in my heart…. i got ricepaper, saddle and the 239 at the same time, and i wore just those two shadows together (ricepaper all over upper lid, saddle on outer third) for….months on end….lol now i can barely imagine wearing the same two shades everyday! Oh, that’s a great combo. I do something similar with Soft Brown. I could easily wear it for months on end! What are your go-tos these days? 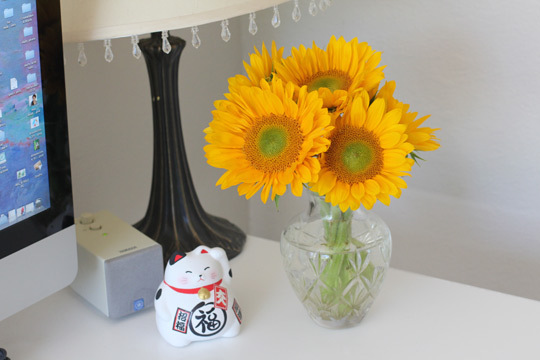 the go to’s are constantly changing….these days it’s sparkle, neely, sparkle! Better than a browlift job, I say! As you said about another Unsung Hero (Lychee Luxe, perhaps? ), ‘It has great magical powers’. Maybe that’s exaggeration, but Ilove Ricepaper since I have brows that arch like steep hills and thick glasses. This shadow is like a xenon bulb: it lights up my peepers! 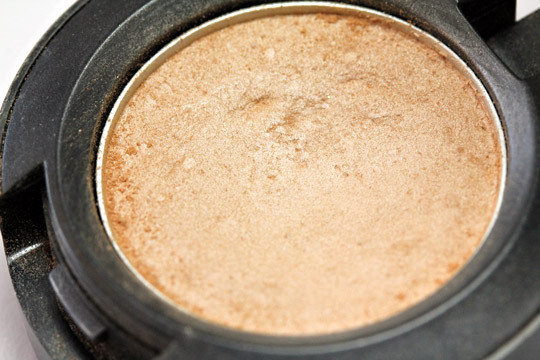 It never looks so pretty on my lids, though it’s my favorite highlight e/s and i love to wear it in the inner corners. I pick it up more than couple of times in week to highlight under the brows. It lifts my brows and give the look a nice glow. Eesha recently posted … Make-up over the weekend!! Let me start off by saying that I am very much a high end product junkie, but my all-time favorite shadow shade is Champagne from Covergirl (been wearing it since the 90’s). It looks really similar to your swatch of ricepaper so I may have to buy it to see how similar they are (ricepaper looks like it may be a bit more peachy). I’d love to be able to replace it with a MAC shadow b/c I just recently found out that CG tests on animals so ethically i can’t justify buying anything from them anymore. I’m the same way! I wear Champagne every single day, no matter what else my look consists of, as an inner corner highlight. It looks absolutely perfect with everything, I LOVE it. People always look at me like I’m crazy when I tell them my favorite shadow is a Covergirl shadow. I picked it up one day on a whim and haven’t looked back. Karen can you share your recipe for that toasted deliciousness? omg girl ur makeup has been on point lately! i adore the cheek and lips. is that the montego bay / evo revo combo again?? ok so truthfully i’m an urban decay eyeshadow snob but ricepaper and woodwinked are now on my list of must haves for suuuure. Karen, what lippie and blush do you have on in your MAC ricepaper pic? GORGEOUS! It looks really pretty on you. Gold tones are usually not so great on me, though. I think I’m more of a white/silver girl. Maybe in the summer? 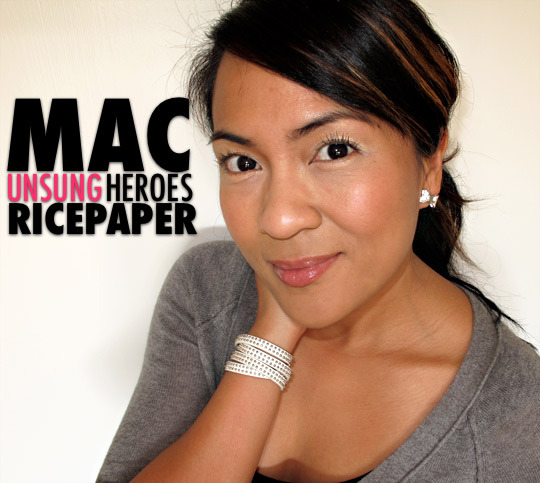 RICEPAPER….along with Suede, Club, the now retired Mango were my very first MAC purchases! Still use them to this day, although I have never been able to replace Mango. Love, love, love ricepaper….sad that I dropped it and have all but given up on trying to make use of the last few tidbits in the pan. Must remember to pick up a replacement. This shadow looks so nice on you! Ricepaper is the EXACT color of my skin. I use it to give just a little sheen to my brow bone, especially when I want the attention all on my brighter lid colors. Love it! !